The 19-year-old has already begun attracting interest from Europe’s top clubs, and it seems that Manchester United are keen to snap up the teenager as soon as possible. The United scouts even found their way to Estadio da Luz this Sunday, to see the youngster feature in a 4-0 Benfica win. 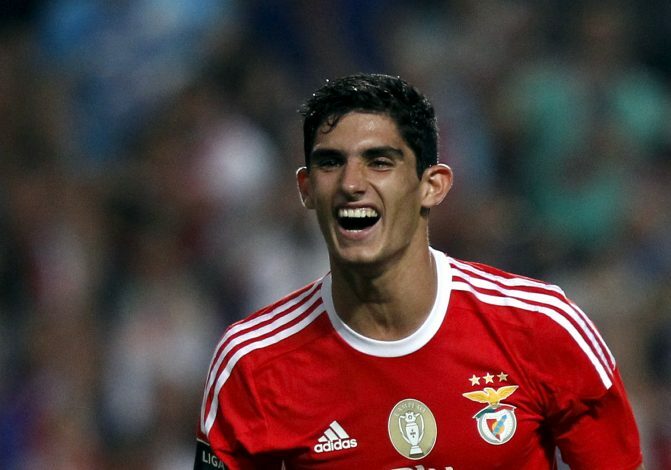 Goncalo Guedes is currently regarded as one of the most promising Portuguese prospects playing at the moment, with many dubbing him ‘The Next Ronaldo’. The teenager has represented Portugal at all levels, from the U15s to the senior squad. However, he was not included in the Portuguese side that lifted the Euro 2016 trophy. Guedes’ current contract with Benfica runs out in 5 years, but with clubs like Manchester United already registering their interest, he could not be in Portugal for too long. Originally a winger, Guedes’ position has been altered this season, to a more centralized role. Benfica coach Rui Vitoria changed the youngster’s position in an attempt to fill in the gaps left in his squad this summer from the departures of Renato Sanches and Nico Gaitan. Guedes has scored 1 goal in his last 8 matches, but many still regard him as one of Portugal’s finest talents at the moment. Besides Manchester United, scouts from Juventus, Middlesbrough, and Valencia were also in attendance last weekend to watch the midfielder. Guedes started the match in attack, alongside Kostas Mitroglou, but both players failed to make it onto the scoresheet. Manchester United may be able to outbid all of the interested parties, but they may not be able to offer much game time to the youngster. The Mirror reports that the young starlet could be on his way out of Benfica as soon as next summer, despite having 5 years left on his current contract.